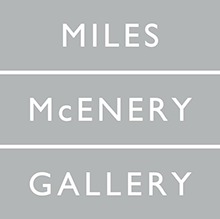 Eric Green’s current exhibition at Ameringer | McEnery | Yohe consists of six works all of which are colored pencil drawings on board. The most striking moments occur in the mirrored works: each panel contains two identical renditions of the same space with the upper half (the first drawing) in an upright orientation while the lower part (second drawing) is rotated by 180 degrees to form a mirrored counterpart to the upper half. What makes these drawings so fascinating is how each half relates to its twin or double. In case of Mirrored Room One (pictured above) the light fixture in the upper right does not appear as a reflection below it in the second, inverted half. Instead, the ceiling light is placed on the opposite side - the lower left. Usually mirror images work in two ways: either as a vertical or horizontal mirror image. But in Eric Green’s work we are looking at a diagonal mirror image on a vertical line of reflection. In addition, the room or rather the ceiling we are looking at is represented at an angle. If we imagine ourselves inside this space, we would be standing turned toward the right corner of the room and away from the main window. Why do these observations matter? This particular arrangement of the upper and lower part complicate the space we are looking at and it becomes trickier to perceive the upper and lower (inverted) part as two versions of the exact same drawing and space. The spatial and perceptive complications do not end there. 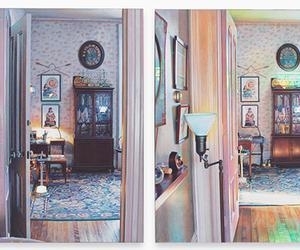 Due to the drawing’s cropping (only half the window is visible while most of the ceiling is exposed), two featured mirrors are suddenly alongside each other (see above), they touch in one point, yet they remain separate; they are reflective, but unaware of their forced proximity. This artificial alignment results in oddities which expand and contract the rendered space beyond its initial boundaries: the ceiling is a floor, the window points to an exteriority made of light and heat, and the mirrors refract any sense of a unified or logical space. In many of Green’s drawings on display, the richness of certain interior decorative elements (the ceiling in Mirrored Room Four, for example) finds a more than appropriate medium in colored pencil. I cannot think of another contemporary example in which colored pencil is able to take on various textures while enriching them with colors that - upon closer inspection - fill every available crevice in the picture. Eric Green’s drawings produce a heightened perceptive state in which the mundane turns opulent, in which color and light seep through furniture, glass, mirrors and wood. Green’s work is not mere trickery or exercises in facility; his interiors are spaces that have spectacularly collapsed onto themselves: they appear compressed and incomplete - two identical images that are estranged and yet they amplify each other. All the repetition, duplication and mirroring sets up what can be best described as a series of inexhaustible interiors that never fully align as a whole. But this is not to say that something is amiss here. Eric Green delivers tour de force imagery that is a study in defamiliarization: his interiors deny viewers full entry and instead propose a renewed look at the familiar. And so we find ourselves suspended in front of Green’s twofold spaces waiting for a new, third interior to emerge.